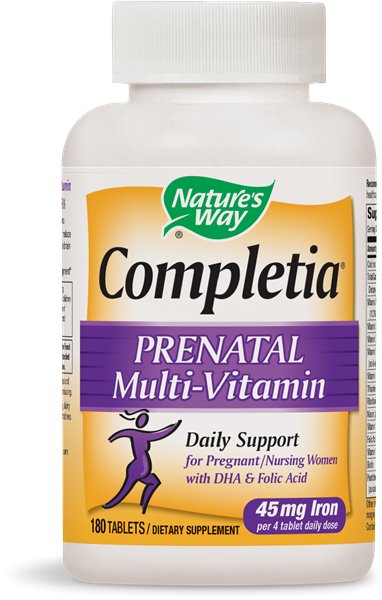 Completia Prenatal / 180 Tabs - Nature's Way®. Take 2 tablets twice daily. If taking any medications, consult a healthcare professional before use. Why do you use Folic Acid instead of Folate in your prenatal supplements? Folic acid is the synthetic form of folate used in supplements and in food fortification. It is converted in the body to various biologically active folates, including in pregnant women (1). Nearly all research demonstrating clinical benefits of folate has used the folic acid form. Folate supplements have recently become available and include methylfolate and 5-methyltetrahydrofolate (5-MTHF). While these compounds have the theoretical advantage of being biologically active forms of folate, they are less stable than folic acid. Research on them is still in the emerging stage and there are currently insufficient data regarding their absorption, uptake into cells, and effectiveness in addressing folate-responsive conditions. Thus, with a few possible exceptions, folic acid remains the preferred form of folate for supplementation. (2) REFERENCES 1. Obeid R, Kasoha M, Kirsch SH, Munz W, Herrmann W. Concentrations of unmetabolized folic acid and primary folate forms in pregnant women at delivery and in umbilical cord blood. Am J Clin Nutr. 2010 Dec;92(6):1416–22. Epub 2010 Sep 15. 2. Gaby AR. Nutritional Medicine. Concord, NH, Fritz Perlberg Publishing, 2011:72–78. Accidental overdose of iron-containing products is a leading cause of fatal poisoning in children under 6. Keep out of reach of children. In case of accidental overdose, call a doctor or poison control center immediately.